We are working to build the definitive Yoga Asana Index. If you want to contribute, please Create a FREE Account. 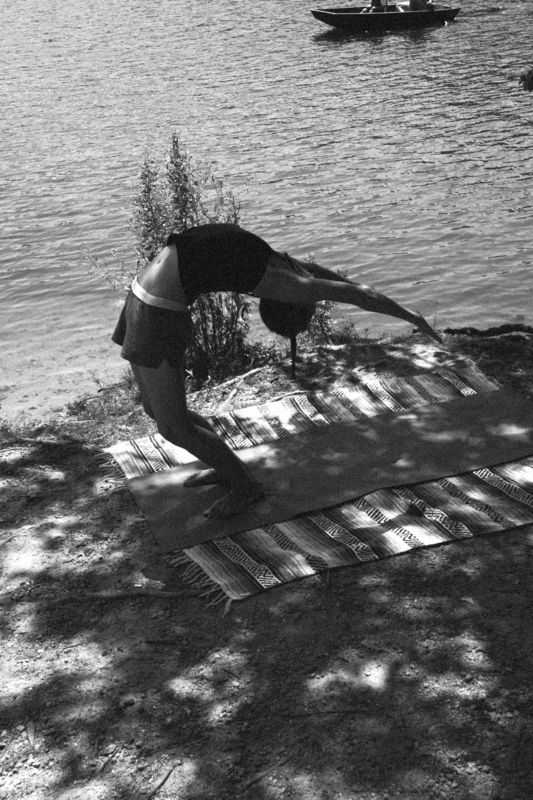 Show Us Your Asana! To contribute to the Asana Index become a community member. 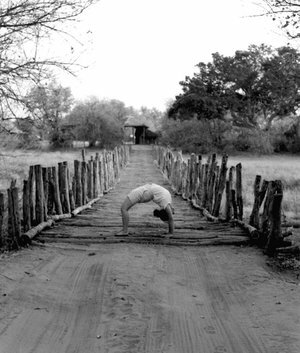 Submit an asana post with your description of the asana. View (Ardha Chandrasana) for an example. Thank You for contributing the asana index! Supported on a chair, with hands and feet on floor or blocks; knees bent; pushing up if possible. Geometry: Supported by my Hands and Feet, my back is arched. My entire body is arched like a bow. Place a chair at a distance of one to one and a half feet from the wall. Place two blocks in the medium height position on the wall for supporting the palms Sit backwards in the chair with the sacrum and lower shoulder blades on the chair. The feet are hip distance and parallel and the knees are bent. Place the wrist side of the palms on the blocks. Fingers face the feet and the elbows point straight up towards the ceiling. Push the body up by pressing the palms on the blocks so the trunk is lifted. Pull the back of the thighs towards the buttocks and contract the buttock muscles to lift the thighs up. Tighten the biceps by pushing the elbows in, so the arms remain straight and the chest is well lifted. Push into the hands to take the shoulder blades in and broaden the chest and the ribs. 1.Use the strength in the legs to lift up in the pose. Extend from the outer hips to the outer knees. Roll the front thighs in and press firmly through the feet to lift the lower body. Roll the back inner thighs out to broaden the lower back and sacrum. The tailbone moves in and up. 2. Externally rotate the arms and move the shoulder blades down the back. Extend the elbows to the wall and up towards the ceiling to help the arms be in a stable position to lift up onto. 3. Once the arms and shoulders are in the above position. Press the hands to lengthen the sides of the body and lift the chest. Extend from the outer hip to the outer knee and draw back from the inner knee to the inner groin. Lengthen the trapezius away from the neck and lengthen the back of the neck and soften the eyes. Draw the outer elbows in. Lengthen the outer arm to the elbow and the inner elbow back to the armpit. Lift the backs of the thighs towards the ceiling. Lengthen the Hamstrings to sit bones. 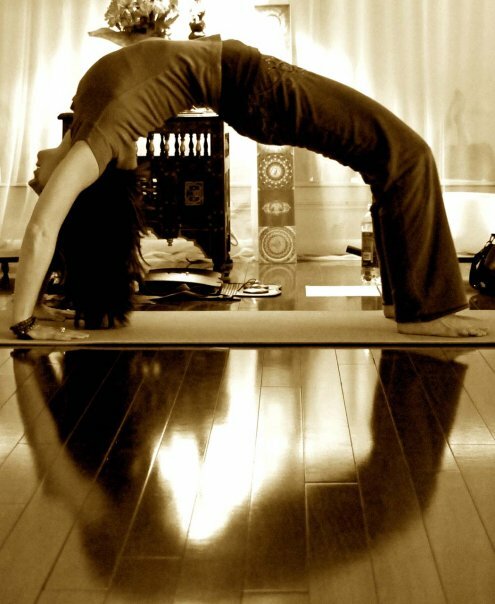 Show Us Your Asana! Contribute this Yoga Pose's Benefits to the Asana Index. Visit Your Dashboard and Contribute Now! Show Us Your Asana! Contribute this Yoga Pose's Beginners' Tips to the Asana Index. Visit Your Dashboard and Contribute Now! The feet are not parallel – To correct – have the student look at the feet before bending backward to see that the feet are parallel with the outer edges of the mat. The inner edges of the feet lift up – To correct – Press the inner edges of the feet down. Press into the four corners of the feet as in Tadasana. The knees splay out – To correct – Roll the front thighs in and extend from the outer knees to the outer hips to take the knees towards one another. The lower back is overarching – To correct – Extend the tailbone towards the knees and lift the front of the pelvis towards the navel. The elbows splay out. To correct – have the students draw the elbows in towards one another when they place their hands on the blocks or on the floor and lengthen their elbows to the wall. The chest is collapsed – To correct – Move the shoulder blades into the back and broaden the collarbones before pressing up. Keep the shoulder blades into the back and lift the sternum as you press up.